This year again, RAJA welcomed on Thursday, February 28th, 2019, 17 girls accompanied by the association Rêv'Elles supported by the RAJA-Danièle Marcovici Foundation since 2015. This visit is a key step of the «Training: reveal your potential », a one-week internship to help high school girls from priority neighborhoods find their way and define their professional project. 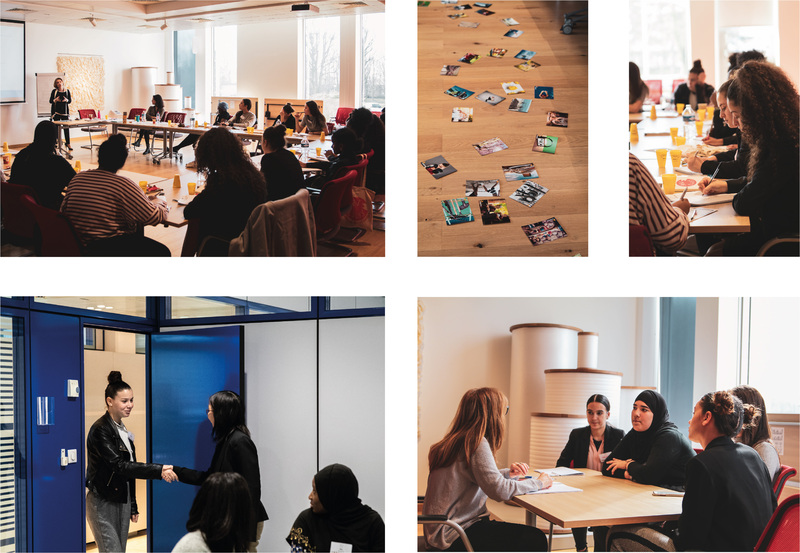 For one day, girls were able to discover the corporate world and meet women with inspiring paths. The goal? Let them have more confidence in themselves and consider a professional future they would never have dared to imagine! Bonjour, Cet article peut vous intéresser : https://www.fondation-raja-marcovici.com/en/uncategorized/discover-raja-with-the-association-revelles-a-day-of-exchanges-sharing-and-discovery-of-the-company.html. Interns since several days with the association Rêv’Elles, the girls were expecting a lot of this day: “I am curious to discover the company RAJA and the corporate world, it is a chance to be here”, “I look forward to discovering new things and, most importantly, the business world because it’s the first time for me,” they said when they arrived. The day began with a presentation of the RAJA Group by Camille Rainsard, Human Resources Manager. The girls then loaned themselves to the exercise of photo language on the representations they have of the company, then to a workshop on the codes and know-how that are specific to it. Thanks to the presence of the Human Resources team and RAJA managers, the girls were able to apply what they learned by carrying out simulations of job interviews. “The girls were very different from the people I used to interview, they have spontaneity and freshness that are really nice,” says Émilie, RAJA Recruiter. A visit of the premises, mainly the distribution centre and the customer relations centre, allowed girls to discover the variety of existing jobs in a company. “The size of the awesome warehouse,” “I liked seeing women handling machines,” “I was surprised because I didn’t imagine the RAJA site was this big,” she said. “It’s interesting to have a place where the logistics and offices are grouped together,” the girls say. Several collaborators from different departments (Communication, Foundation, Logistics, Customer Relations Centre, Purchasing, Marketing, Management Control, etc.) mobilize to meet the girls and to exchange with them on their journey, their trade and their vision of the company. The girls were able to interview these “role models” by asking them concrete questions. “I liked this exercise because Lucile has a really atypical course and we can say that our path is not necessarily drawn, we have the right to be wrong and change direction. That’s comforting.” explains a high school student. The collaborators also appreciated this moment, as explains Charlotte, Key Accounts Marketing Manager “I am very moved by these exchanges and by your maturity. Thank you for what you brought me, it’s a chance to be in front of you today!” They also wanted to cheer the girls “Don’t be afraid of failure. Failure allows to have a better understanding of yourself, it is part of steps of life. Be proud of you!” highlights Aménie, Commercial counsellor. To end this day, Danièle Kapel-Marcovici, came to meet the girls so to share her experience and transmit her core values: solidarity, boldness and equality between women and men. “The curiosity isn’t a default, be curious! Be honest with yourselves and with others, cultivate yourself and read a lot! Don’t forget that there’s nothing you can’t do, you have the right anything and to do anything. Make sure to have the choice in your personal and professional life. And to have the choice, you have to be autonomous!” she states.